Ignore the cowboy jokes, holsters are great. They keep tools close to hand, stop them ending up on the compost heap, and save your pockets. Chunky 3.5mm leather with copper rivets and hand stitched with double ply waxed thread. Starts off clean and pale but soon matures to a nice dark rich tone. Standard holds all our Niwaki Secateurs, Snips and Pro Snips, but other (probably inferior) secateurs might not fit. Large holds Niwaki S-Type, Niwaki GR Large & Tobisho A-Type Large. Our leather products can come with the odd scuff or natural blemish - that's part of the material and in no way affects the quality. 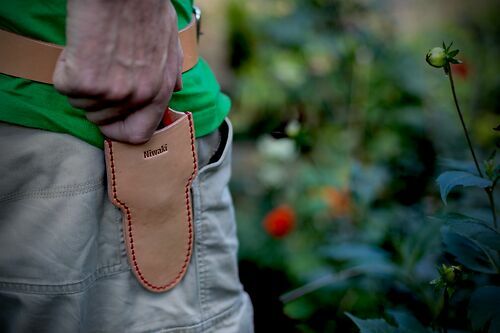 Niwaki Tip: Always keep your secateurs in a holster - even if not on a belt - then you know where they are.